You sit quietly lost in your own silent thoughts and musings about a lot of things. The dreams you waved as a young child . The naughty whispers you had with friends while growing up. Just musings about life and thinking what it means to be accomplished. You see friends parade their families and while you are happy for them, you sometimes feel like you are a complete failure. There is no family to parade. You hear people brag about their exploits and you sit quietly and listen. You are not jealous; you just wish you have exploits to brag about you are human after all. Then again you ask yourself what is accomplishment? You grow sad and melancholic. You are happy for your friends but this heavy something called failure weighs you down. Your musings are good, your worries normal, you are first of all; human. Still before you think you have not accomplished anything, let’s take a look again at you all these while. You seem to be the last among your peers with no kids or a mate? Never mind. Your friends probably had it easy. They didn’t have to put up with the ignorance and often stigmatizing attitude of the community. They didn’t have to battle with possible in-laws who already see you with a rose ready to meet your maker; leaving their brother or sister alone for the simple reason they came to know you are a warrior. They didn’t have to deal with the prejudice of a narrow minded community who refused to look past the superficial and separate being an SS from the person. They didn’t have to fight hard resisting people who consider you good enough only for a quick roll between the sheets because they are probably doing you a favour no one else would. It took you a while to break the apron strings and leave home? And while your friends were probably planning to build mansions you are planning on renting your first single room? It is not the end of the world. While your friends were groomed to leave the house as they hit 20s, you were probably made to feel even with the best of intentions, that you just could not make it out on your own. While your friends were applauded and even pushed out the door to independence, you probably had to fight for yours after taking years to convince yourself that you can do it. And while your friends were busy raking in millions, you probably had to fight with an unsympathetic boss from dismissing you each time you needed the trip to warriors’ favourite rest house, the said house which became favourite not by choice but by circumstances. 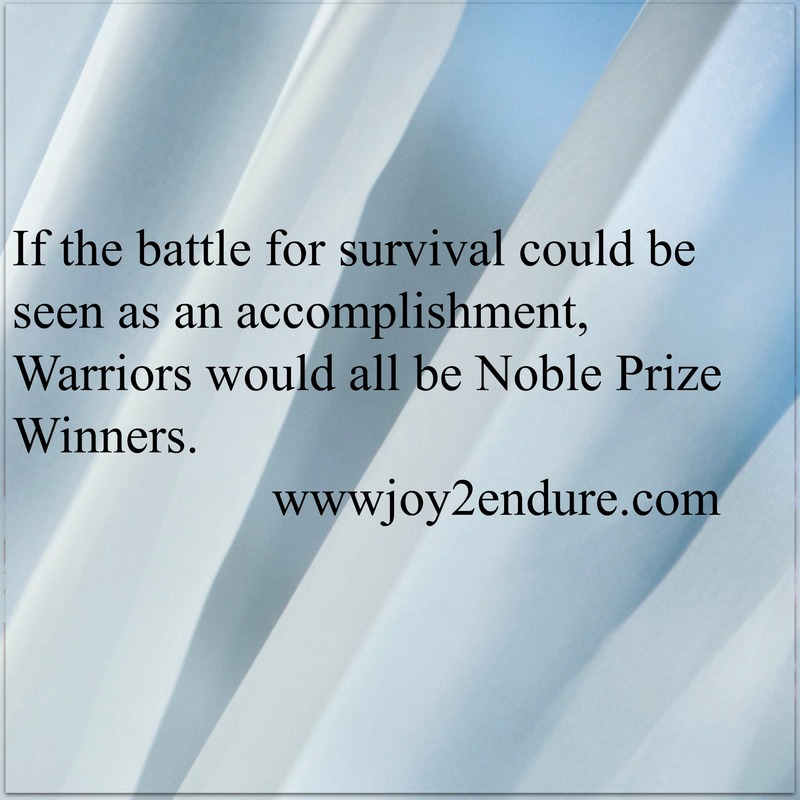 The list can go on and on but one thing remains, if you as a warrior faced all the above situations and many others not mentioned here and still came out smiling, happy, hopeful and ever ready to take it as it comes, that to my book is an accomplishment; for the simple reason that fighting to stay alive is itself an accomplishment and if the organizing community of awards and recognition could consider this, we all would be peace prize winners many times over. Granted, the battle for survival is real for everyone, but until you wear the shoes, you will hardly never know what it means to leave the hospital to the examination hall, to swallow agonizing pains to be at work because you are afraid of being fired, to have your suitability as a wife or husband questioned only on the basis of your condition, to constantly deal with people who consider you walking corpses, due to ignorance yet never really bothering to understand what you and your family go through. The fact is, getting your body injected again and again; pumping medications into your system like daily bread to stay alive… etc… Yet, you come out always happy, determined to take it slow as the days come without weighing or pitching yourself against others, that my fellow warriors is itself, an accomplishment. Prev The Ghost Of Buea Council Past: Is Social Media The New Voice of the Voiceless? Next Reclaiming Our Identity: The Things We Lose On Our Way to Civilisation 2: Born Houses. Waking up from bed, I log into Facebook and say lemme see what is on my timeline and the first article I read for the day is this. I am speechless but I must say you are an inspiration. People define accomplishment based on their achievement or what they have like family, houses, kids etc, but is that it? I can’t walk in the sun becos at the slightest moments I will trip off and when i do it takes grace for me to come back and like u, that is an accomplishment. Thank you very much Kwesi. You are right, accomplishment comes in different ways. It is all about how we see and define it. Yes, your being able to bounce back from tripping due to the sun, is an accomplishment. Keep it going. Thanks for stopping by again. Please do come again. Oh my God, this is so deep. I savoured every line keenly and it touched my very soul. You are one of the most accomplished people I know. A lady with a beautiful heart and a very healthy self-esteem which defies every odd. A lady who truly cares for others and is so gifted. You deserve a sweet caring man because you are truly phenomenal. Everyday that passes, you are redefining history. Thank you for penning this intelligent piece. Oh wow thank you so much Precious. Always very encouraging with your words,this beats it all, thank you! Thanks for this read Arrey, always pure joy connect with your your mind’s musings. I particularly loved this one cause it hit home, especially because i have often been described as being too content, too satisfied and too independent in my single-childless-houseownwershipless-carless state. i have failed to measure up to many people’s standard of a successful person and yet I am never seen actively pursuing these things. My formular for happiness? No answer. Just be the best person you can possibly be, now, at this moment, with all you’ve got NOW!! Aww Sis Maureen, thank you very much. We plenty de for that childless-houseownershipless-carless state oh. The hustle is real and we have to face many who measure and find us wanting but like you rightly said, being the best person you can be NOW is what truly counts.